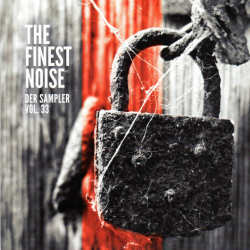 About every six months, Finest Noise Records from Troisdorf, a small indie label / distribution company, release a compilation featuring unsigned bands. The CD is given away for free at certain events, and can also be ordered for the price of postage and packaging. Edition 32 was somewhat disappointing as it couldn’t quite reach the level of its predecessors. Number 33 feels a bit like Germany at the Eurovision Song Contest. The CD may not be the worst, like Germany’s attempt with Jamie-Lee who ended up last, but compared to its predecessor, it is not really an improvement. My major problem with the current edition is the topic of cultivated ennui. Many featured bands are technically ok, but their music is taking no risk, as if they were afraid to rub somebody the wrong way. There are some bands that left me totally cold, like the Coldplay clone 4Lane, and Irvine Gass with their too tame mix of indie and electronica. Other weak contributions come from the harmless Lights Out, the gloomy Morphine sound-alikes Notion Sound Collective, the unspectacular dream pop act Shaky Foundation who really do their name justice. The compilation also has a couple of retro rock bands that also failed to amaze me: Bender who dwell somewhere between rock, blues and grunge; Flying Fields sound tired; Wild Society play a mix of hard rock and country; and Braggpeak feel too close for comfort to Creedence Clearwater Revival. Nine misses and ten hits... this feels a bit like the penalty shootout between Germany and Italy during the Euro 2016. Better although not great are Toma (indie rock meets diskurs pop), the powerful rocker Marius Stärk, Billy Idol clone Q.Age, the danceable indie electronica band The Crystal Apes as well as the feminist inspired rock song from 3ling. Which brings us to the Top 5 of this compilation. Number five goes to Leonard Las Vegas, a duo that works interesting sounds between wave and post rock. Number four belongs to Die Traktor who play traditional yet very decent punk rock. The bronze medal is for Deadbeat Hero whose fierce post core comes with many twists and turns. Silver is taken by Pygmalion who fortunately don’t play Irish folk, but sound rather experimental and progressive. My personal favourite of the compilation is Monobloc who play diskurs pop with some welcome drive. The compilation is basically free, and thus you can’t do anything wrong by getting it. I don’t want to accuse Finest Noise label boss Keule of being a bad curator, but if he doesn’t get any worthy contributions, he possibly can’t come up with a more interesting compilation. All in all I am somewhat disappointed in the lack of courage from many of the without an exception German artists. Currently too many musicians, not only in Germany, prefer to stick to what they know instead of occasionally thinking outside the box. Maybe that’s why the few truly good artist manage to stand out even more in this otherwise rather average heap.